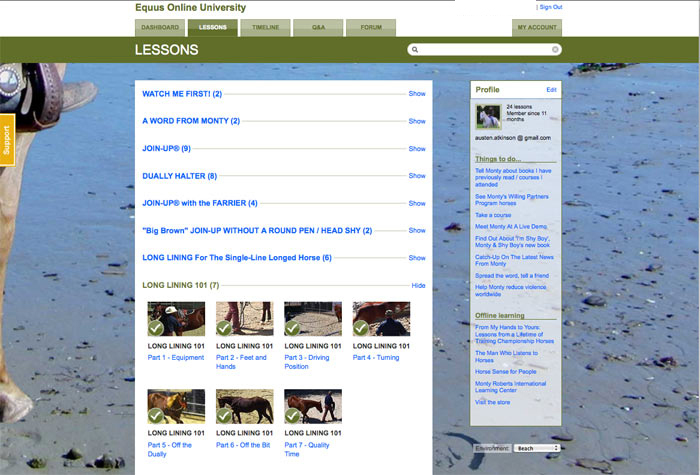 Properly learned, used and communicated to your horse, exactly as demonstrated by Monty Roberts in the Equus Online University, the language Equus, Join-Up® and related concepts will improve your relationship with your horse. 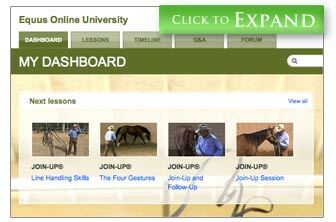 If you can irrefutably prove otherwise, after 12 months of study and application of these theories by you absolutely in accordance with Monty Roberts' guidelines, then you may claim your student subscription back, under this guarantee. Under these unlikely circumstances, please contact debbie@montyroberts.com to explain your problems. Thank you. 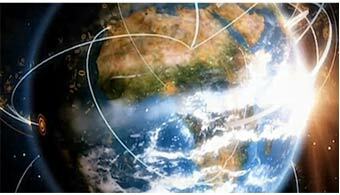 Solvang, CA (October 3, 2011) – On the 30th of August 2011 the scientific paper authored by Drs. Veronica Fowler, Mark Kennedy and David Marlin entitled ‘A comparison between the Monty Roberts technique and a conventional UK technique for initial training of riding horses’ was accepted for publication in Anthrozoös. Anthrozoös is a quarterly, peer-reviewed multidisciplinary journal reporting the interactions of people and animals, a journal which has enjoyed a distinguished history as a pioneer in the field since its launch in 1987. 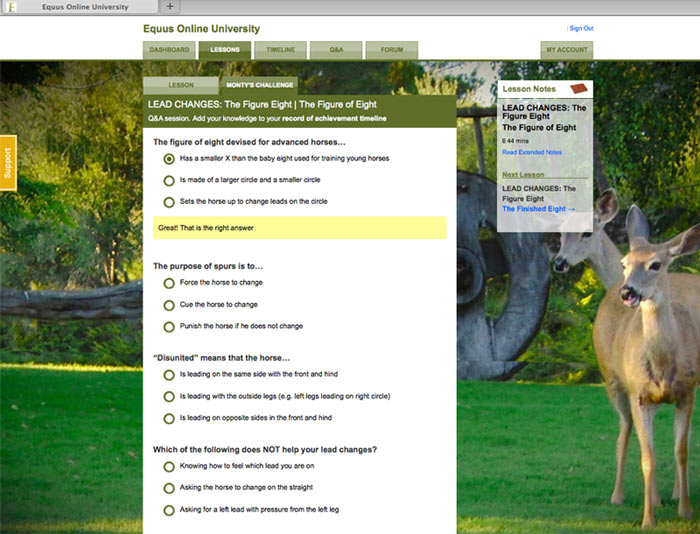 Prior to appearing in print in Anthrozoös the study will be presented at the International Society of Equitation Science (ISES) having been accepted by the scientific committee and also presented at the Centre for Animal Welfare & Anthrozoology, Department of Veterinary Medicine University of Cambridge both in October this year. 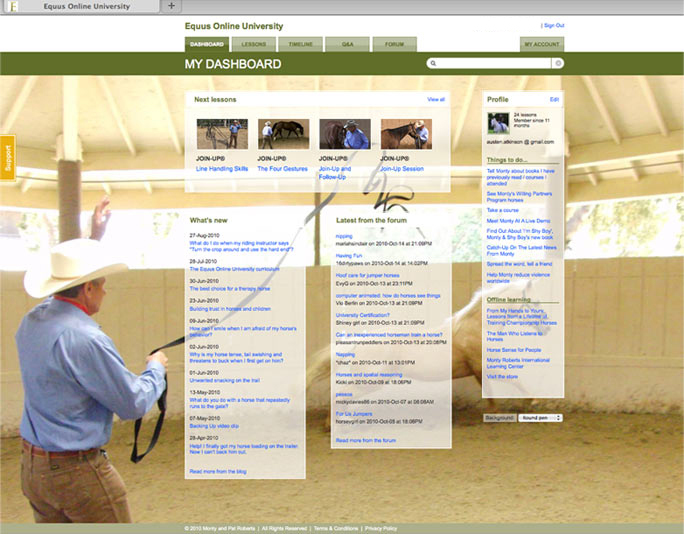 This study describes a comparison of the efficacy of the Monty Roberts horsemanship technique in comparison to a UK conventional training technique for the initial training of horses. Initial training of young horses, in particular the first time a horse is saddled and ridden has been recently reported in the scientific literature as a significant stressor in terms of the impact on the welfare of the horse. It is therefore vital that we fully evaluate the techniques which are practiced around the world to identify those which have the potential to cause compromised welfare and suffering during foundation training of horses. Our study reports that horses trained using Monty Robert’s methods had significantly lower maximum heart rates (bpm) during both first saddle and first rider when compared to a UK conventional training method. Monty Roberts trained horses did have significantly lower heart rates during first saddle and first rider backing process (i.e. heart rate reduced between first saddle and first rider), a finding which has never previously been reported in the scientific literature. Thus the heart rates observed from Monty Roberts trained horses during first saddle and first rider are currently the lowest reported for any training regime reported in the literature to date. 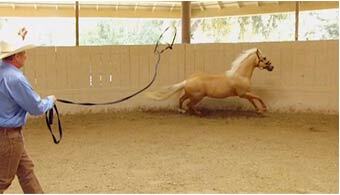 The use of the round pen and in particular the technique of Join-up have been frequently criticised and reported in the literature to be another significant stressor due to the perceived opinion that this environment and method overtly activates the flight response. 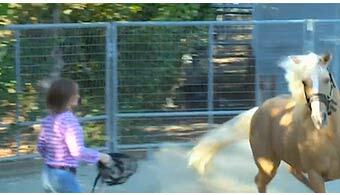 Our study could find no evidence that the use of the round pen or, indeed the technique of Join-up, was fear inducing and thus a significant stressor to the horse based on heart rate alone. In fact, we found that the heart rate of horses during this technique were considerably below the maximum heart rate for horses of this age and breed. Following 20 days of training (30 minutes/horse/day) the study horses undertook a standardised ridden obstacle and flatwork test and a ridden freestyle test. Heart rates recorded during these tests for both training regimes were not significantly different; however Monty Robert’s trained horses scored significantly higher in all three tests as determined by a panel of judges who were unaware of the study or the trainers involved in the study. Our manuscript therefore provides peer reviewed scientific substance to indicate that that the Monty Roberts training technique is highly efficacious in terms of the effect on the welfare and performance of the horse undergoing foundation training. Join-Up as you have never seen it before. Mounting block lessons that will amaze your friends … Show Jumping with Olympic Gold Medalist Will Simpson and Monty in Wellington Florida …. Ada Gates and Monty explore Farrier mastery … Charlotte Bredahl and Westpoint demonstrate championship Dressage in Monty’s arena at Flag Is Up Farms … Richard Winters and Monty share Western Reining tips … and more! Solve bad habits and learn training tips from the best! 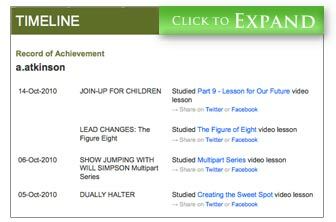 New lessons are added every week. Is it easy to use? Click on the video above to take a quick tour OR Click here to register, log on and see for yourself! Everyone! Young and old! There are lessons for children, adults, professionals and amateurs. Monty says “Adrenalin up, learning down. 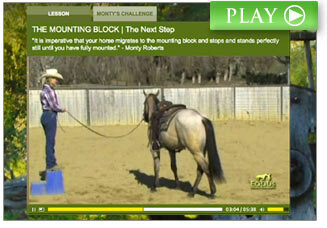 Adrenalin down, learning up.” Monty will give you the knowledge to convey to your horse a calm, confident leadership. 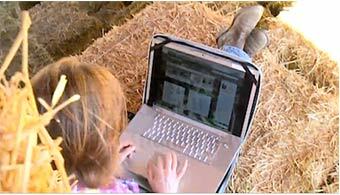 This learning environment will have huge benefits for the non-equestrian as well. See your relationships at home and at work improve, just because you begin to be aware of how you communicate. The whole format is very easy to use, even if computers aren’t your thing! 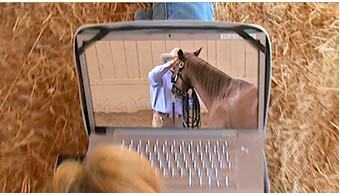 “My desire has always been to have the maximum positive affect on you and your horse. 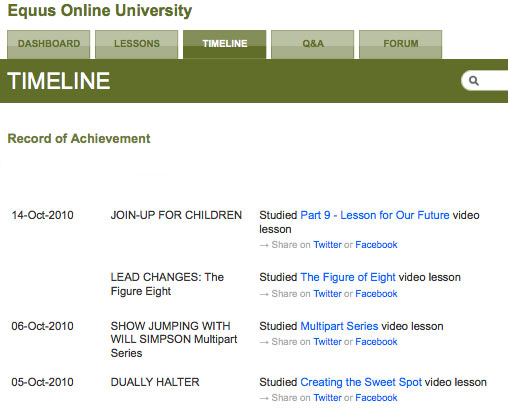 In 2004 we began filming thousands of hours of my problem solving demonstrations to be able to launch this tool in 2009 and share these skills with the world. Monty priced his Uni for everyone to be able to afford it. It is only $59.99 for a six-month subscription or you can choose the twelve month option at $99.99 for unlimited access to a wealth of information from arguably the world’s best horse trainer. 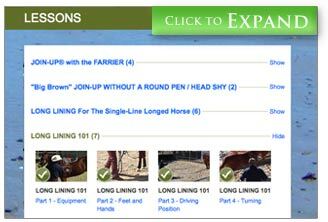 No matter what your background with horses, Monty guarantees that his ideas and techniques will change how you and your horse learn. Monty created a hugely varied syllabus that he is constantly adding to as he trains new horses and has breakthrough ideas. 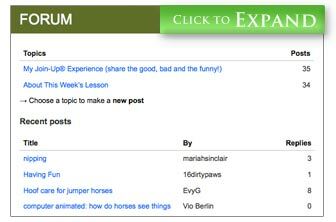 There is a new lesson added EVERY week! See below in great detail. “Dear Monty and team! You make me so happy with your lessons! 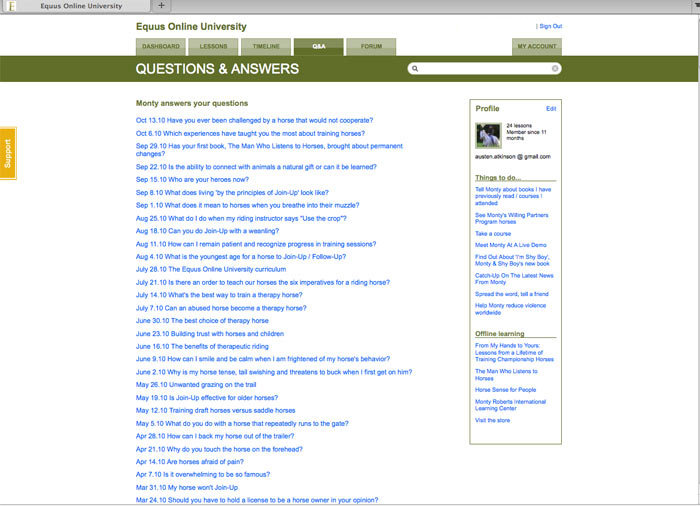 I use it every time a question arises in my mind. 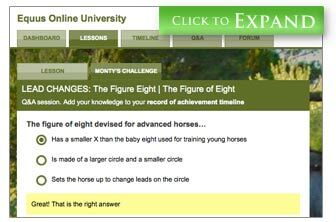 I have the question, you the answer!” With kind regards, Jessica L.
Current Syllabus for Monty’s Equus Online University … New Lessons Added Every Week! 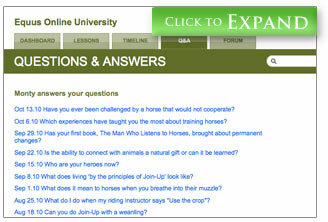 when a new lesson has been posted to Equus Online University. 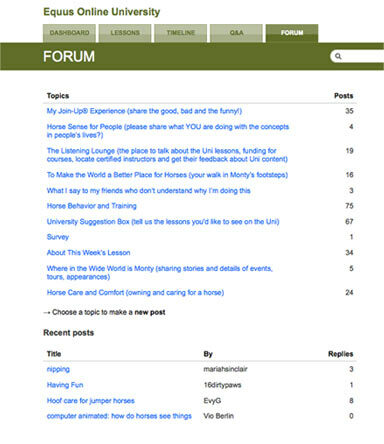 up-to-date and in-touch with Monty!